How Bright will Black Stars Shine? Looking at the history of Black chess in America, we can see that there have been phases where players were thriving. Of course we can look at the 60s in the times of Walter Harris, Frank Street and Kenneth Clayton; we can look at the residual effect of the "Fischer Boom" where Black "masterdom" exploded in the 80s only to die to a trickle in the 90s. Now in the 21st century, we are entering a new era of chess where scholastic ranks have blossomed and the youth are playing chess in record numbers. 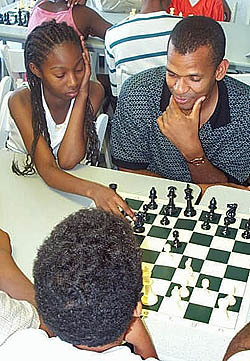 In the Black community, chess has enjoyed success at the scholastic level, but there has always been the issue of getting players to stick with chess once they leave the scholastic environment. 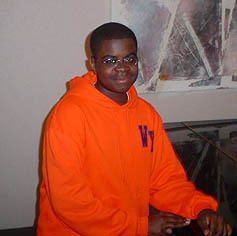 In my high school (99% Black), there were about 100 players in the thriving club. To my knowledge, I remain the only active player. What causes some players to remain and some players to leave chess totally? That would make for a good study, but certainly schooling, career, family and other ambitions may take precedence over chess. Jacob Wamala is one of the brightest scholastic stars on the horizon. 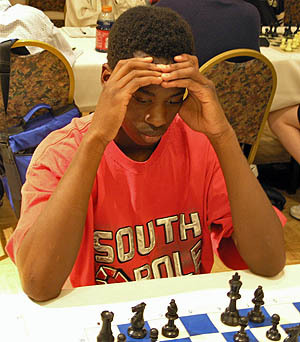 He is the high school co-champion of Massachusetts and has a sister Jessica Wamala who will represent the state at the Polgar tournament for the second year in a row. Photo by Daaim Shabazz. As we look at today's talented players such as Jacob Wamala, Kayin Barclay, Jimmy Canty, Bennett Joseph and Tapiwa Gwaze, what does the future hold for them in terms of their chess aspirations? Top female players like Medina Parrilla have been successful while Jessica Wamala, Brianna Conley and Darrian Robinson are the new up-and-coming players distinguishing themselves. Robinson will play in Ecuador in a few weeks and hopefully will raise the funds needed to travel to Batumi, Republic of Georgia for the World Youth championships. Parilla has also qualified and will hopefully make her 3rd trip for this tournament if funds become available to travel. Many of the players mentioned can use their respective chess accomplishments on the résumé for college entrance applications and would be justified in doing so, but can these accomplishments be taken to a greater level? In looking at chess environment in the Black community, I have noticed the following issues needed to harness young talent. 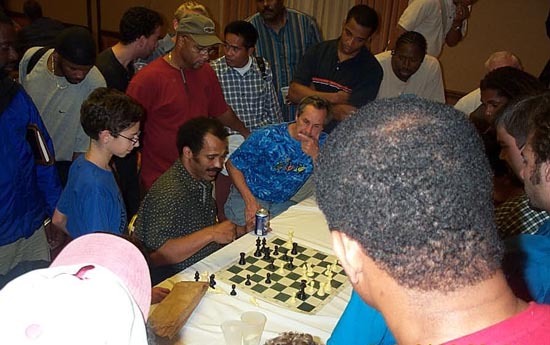 Many of the issues are not unlike issues of the general chess community, but given the unique social conditions in the Black community, these points may take on a greater significance. One problem is that there is very little mentorship in chess… and in the Black community especially. The most successful instances of grooming talent happen in large metropolitan areas where a number of players congregate and develop informal networks. It should then be no surprise that New York, DC/Maryland, Philadelphia, Chicago, Cleveland and Detroit (not ranked) are the main incubators for Black talent. There are also thriving talent pools in larger states like Texas and California. The "Black Bear School of Chess" out of Brooklyn, New York has had the only formalized structure for producing chess talent. Maurice Ashley often talks about the mentorship he received amidst the fierce rivalries. William Morrison, Ronald Simpson and Ernest Colding showed Ashley the "hard-knocks" of chess. The same was true for me as a rising junior in Chicago. My training at Tuley Park every Saturday and informal association with Marvin Dandridge and Roger Hickman were keys to my early successes. Stephen Muhammad mentoring students during visit to Harlem Educational Activities Foundation. Photo by Daaim Shabazz. At the annual World Open chess tournament in Philly, there is usually talk about how to harness the talent in the Black community. There was an interesting meeting some four years ago highlighting some of these issues. Maurice Ashley stated in that meeting that while popularizing chess through marketing efforts is fine and good, the need to identify talented young players and place them in a special track for instruction is paramount. There are many instructors from coast-to-coast performing coaching services. Whether a large-scale integration of efforts (among Black coaches) is feasible remains the question. Currently, there is no networking structure for sharing ideas, knowledge and resources. This activity usually happens on an informal basis, but there needs to exist a more organized forum to facilitate such a process. The wave of web blogging and discussion boards makes such an idea both feasible and sustainable. Such an idea can serve as community bulletin board for solidifying coaching efforts of young talents, soliciting sponsorships, sharing chess literature and organizing tournaments. Many of us can remember the time when no magazine carried news pertaining to players of African descent. One could very well believe that no master-level players of African descent existed. This lack of media coverage (even today) means that a network is needed to help highlight the accomplishments in the sport of chess. The idea of having role models is a common idea in most sports. Everyone knows the importance of a Maurice Ashley, but more veteran players need to take an active role in building these crucial networks. A networking structure helps to build in a support mechanism and provides encouragement to up-and-coming talent. It would not be a stretch to say that many schools are financially-challenged when it comes to tournament travel and expenses. Many schools in large cities have to scrape up funds and find dedicated coaches who will be content with small budgets. In Salome Thomas-EL's I Choose to Stay his team relied on the graciousness of the community to send a team to the 1997 "SuperNationals" where they won a national title. Oakhaven got assistance from boxer Lennox Lewis and won a title. Dedicated coaches work miracles at their own expense and there should be more done to assist them in this work. Perhaps more public relations initiatives would help attract funding. As of this writing, Medina Parrilla and Darrian Robinson are having tremendous difficulties getting funding to travel to the Republic of Georgia for the 2006 World Youth Championships. Kayin Barclay will represent Illinois at the Denker Tournament of Champions and is seeking a trainer for this event. Years ago (while still in his teens) the talented Amon Simutowe lamented about his lack of a trainer in helping him rise to the Grandmaster level. He remains one norm short the coveted titled. A young talented player having resources to draw upon can provide a boost of confidence. The last issue is the scarcity of Black players in the top sections. There are far too many players languishing in the 2000-2199 region and too few moving into the upper-echelons of play. There needs to be a concerted effort to flood the master ranks as soon as possible. In an article by Gregory Kearse titled, "A Brief History of Black Chess Masters in America," Walter Harris was quoted as saying (as the only Black master in his day), "It was lonely when I came up." Such a support system for top players is invaluable. How is it possible to inspire young talent in the Black community if there are few instances of Black players competing at the highest levels? Jimmy Canty had expressed how inspired he was when playing off-hand games with strong Black masters. Friendship matches - This idea encourages friendly, but competitive players who are roughly at the same level. It develops camaraderie and it also serves as a way to test one's skills. In the first two matches, players observed the matches and it turned into a social spectacle. The matches were highly anticipated and watched with great interest. Afterwards, each player were able to benefit from the commentary of those watching the game. Annotation Clashes - This purpose of an annotation clash was to provide players with an opportunity to analyze a complicated game and get feedback on who well they accomplished the task at hand. Each of the two participants could use diagrams, detailed commentary and one guest master in their annotations. The previous battles were publicized on The Chess Drum and each visitor had an opportunity to vote for which set of notations they preferred and why. Annotating a chess game is an art form that brings the gave alive. It shows the various paths to be trod… some propitious… some perilous. This appeared to be a good training exercise. Deep Game Analysis - Post-mortem analysis seems to be a dying breed. I have seen players finish a game and immediately run the game through the Fritz chess engine. In other cases, players scamper off and play blitz for a few dollars… addicted to "fast food chess." The problem with fast food chess is that the emphasis becomes winning a few bucks moreso than playing sound chess. With such a mentality, there is no deep analysis and no dialogue pertaining to the intricacies of play that transpired. Even when analysis is done, it often turns into the braggadocio of "winning lines" or a skittles game between whoever happens to be sitting on each side of the board. It's no wonder there are so many stuck at "Expert." Emory Tate is clearly accessible in the area of game analysis. His animated displays are filled with valuable lessons and chess principles along with his usual expressive wit and light banter. There needs to be more examples of this kind for talented youth so they can see how a Master is able to appreciate the intricacies of a given position. Tate provides an invaluable service chess and rarely does one see a player of his caliber willingly offer this public service. He not only does it willingly, bit seems to be a training tool for him as well. Perhaps some of the young players should try this exercise. Emory Tate at 2001 World Open in a classic moment… showing Kudrin-Tate. Lack of initiative is the killer of great idea. Someone once said, "Ideas not coupled with action are never bigger than the brain cells they once occupied." It is amazing how many ideas are discussed at tournaments, but how few of them are actually executed. Everyone is busy, yet we all would like to see chess thrive. The ideas are wonderful in concept, but the way to make an idea successful is to talk as little as possible about it and execute it! The idea would only have to be a small one to make a big impact. If the futility record for producing masters in the Black community is to cease, more initiative needs to be taken. There have been a handful of national masters produced in the past decade, two IM-elects and one Grandmaster total. With the amount of talent coming through the scholastic pipeline, there has to be a system in place so that young players can become beneficiaries of accumulated knowledge. It is well-known that Maurice Ashley earned the Grandmaster title in 1999… seven years ago. In a recent e-mail exchange, Ashley expressed amazement that he is still the subject of news articles. However, what have we done to help create other stories? What have our contributions been? Medina Parrilla once said she'd like to be the first African-American female Grandmaster. Jimmy Canty stated that he'd like to become a master as soon as possible and ultimately a Grandmaster. (listen to interview) To what extent are we helping to make their dreams a reality? They will shine only as bright as the energy they are able to receive.